A few weeks back, I shared a picture of my homemade broccoli cheddar soup on Instagram @dailyconnoisseur. Many people expressed interest in seeing the recipe, so in today's bonus video, I share it with you! Sauté the chopped onion in a tablespoon of melted butter until soft. Add 1/4 cup butter and 1/4 cup flour and stir until the flour is blended in. Now add 2 tsp bouillon and 2 cups of water (or you can skip the bouillon and just add 2 cups of either chicken or vegetable broth). Add milk. Stir until thickened, about 5 minutes. Then add the 4 cups chopped broccoli and 1 cup riced cauliflower. Let cook for 15-20 minutes, stirring occasionally. Use a blender at this point if you like your soup to be smooth. I like the large chunks of broccoli, so I leave it as is. Add the cheddar cheese and stir until the cheese is melted, about one minute. Take the soup off the heat and enjoy! I hope you have a wonderful weekend! Please let me know how you like the soup! In this week's video, I show you how I get ready with a 5-minute makeup routine and quick hairstyle in order to look presentable for my daughter's back-to-school night. Daily Connoisseur reader, Amy, sent me this photo of Polish Your Poise with Madame Chic in Poland. Thank you, Amy! I would like to share about my night time routine. Growing up the only person in my family to have a night time routine was my father, and it simply consisted of setting up the automatic coffee maker so he'd have coffee to drink on his way to work. All of us would toss our clothes on the floor (my father had a valet stand) and climb into unmade beds when we got tired. I am married and have a toddler with another little one on the way now and I was so overwhelmed by life that a few months ago I started to implement a before bed routine for the first time in my life. I actually made it a check off list so that I could see when I succeeded in my calendar. -Set the temperature and close the curtains. -Put my child to bed. -Make lunch for my husband. -Empty the sink and start dishwasher. -Take out the trash and recycle. -Start a load of laundry. -Brush teeth/wash face/put on pajamas. A couple of times over the last few weeks I have thought quietly to myself, "I'm not going to bother with the list tonight I'm tired." Only to say, "Well maybe I'll just do this before bed..." And next thing I know my one thing turns into the complete list! Mornings run so much smoother when I've gotten ready for them the night before. My husband has had clean nice clothing for work since I started and hasn't had to run to Burger King for lunch. Additionally, I don't feel as if the day has conquered me before it's started. Dear Kathleen, your comment made me smile! One of the great things about running your own home is, you get to set your own routines. I do the same thing. Sometimes when I'm tired, I think I'll just do one thing... and then before you know it, it's all finished! Thank you for sharing your routine with us. I have a set routine that I follow every morning in a specific order. It makes things so much easier, especially if I don't feel well or have slept poorly the night before. I can still get everything done, because I can accomplish my tasks on autopilot. A few of my "tasks" involve taking time for me while I can, like exercising, meditating, and getting dressed. I think it's important to ensure that your own needs are taken care of, too -- not only your family's. One task that I no longer have to do is set out my clothes the night before. Since I implemented the 10 item wardrobe, I no longer stand in front of the closet wondering what to wear. I check the weather, reach in and pull out clothes that suit the conditions and what I'm doing that day, and no matter what I pick, I know that it will look good together and will be attractive. Hi Mimianderly, yes! With the ten-item wardrobe you don't need to lay your clothes out the night before because it is so easy to choose what to wear the next morning, and you know you'll look presentable. Thank you for pointing this out! This week I would love to know, do you ever have "one of those days"? How do you cope? Do you have any fun 'look presentable always' stories to tell us? Let me know in the comment section and your comment could be chosen as comment of the week on the blog. FTC: This is not a sponsored post. All opinions are my own. All makeup used was purchased by me. Some links may be affiliate links. Our week of reader Q&A's conclude with today's question from Akila, who asks about my morning and nighttime routine with baby. I shot these videos in mid-August right before the children went to school, so I have had time to let my routine sink in. It is working well for us and we are now in a lovely rhythm. In the video, I mention I was experimenting with getting up at 6am with the baby, but that has shifted lately to 6:30am as every precious drop of sleep I get is needed! As I start to get more sleep, I will revert back to 6am. I always enjoy answering your questions, it's one of my favorite things to do on the blog! Especially because it opens up the discussion in the comment section and I love reading what you have to say. Thank you to everyone who submits questions to me. Hopefully yours will be answered in the next Q&A segment. Jennifer, I look forward to every single one of your videos. Funny story - I have a chronic illness, some days peeling myself from the bed takes a tremendous amount of work. Well, on Monday I woke up in a great deal of pain. So feeling quite sorry for myself, I decided that the day was lost and may as well be a slothfest. I went into my closet and reached for my clean yet threadbare and totally unpresentable sweats and t- shirt. Then it hit me like a lead ballon that after watching your closet tour, I had again reviewed my closet and THREW AWAY all items that would embarrass me . I cussed under my breath (so not chic) at my beautiful and tidy closet and pulled out a lovely dresses. In the spirit of the book "If you give a mouse a cookie", seeing how nice I looked in my dress, thought a little bit more effort ought to be made. I fixed my hair, hmm, might as well fix my face (looking even more put together), said a prayer of gratitude and began my day feeling and looking much better. Nadege, I applaud you for adopting such a positive attitude in the face of a chronic illness. You are truly inspiring! This comment is going to be rather long, but I've been thinking about it for some time and your post today re: Caleb and clothes for dirty jobs inspired me to finally respond. Most of us look to our mothers and other female relatives/friends for inspiration, but the real style icon in our family was my father. He was a big believer in quality and always looking your best. Although he worked in dirty, dusty potato warehouses and grain elevators (he was a USDA inspector), he never wore jeans, instead always neat work trousers and a collared button-down shirt, and always, always a fedora-style hat (felt in the winter, straw in the summer). He owned two pair of quality work boots that were polished and conditioned on a regular basis and taken to the shoe shop for repair and resoling as needed. I still have several of his Pendleton wool shirts that are of such quality and were so well taken care of that they look nearly new. On weekends when he was able to ditch the work clothes and dress up for church and nights out, he maintained a small quality wardrobe of classic midcentury suits and sportcoats, adding a dash of personality with ties and pocket squares and essentials such as a handkerchief and roll of breath mints in the pocket. :-) He was truly our example for presenting ourselves neatly and appropriately, whether we were in a warehouse or a chapel. Thank you for addressing such unusual situations as Caleb's, as well as everything else you do for your readers. It is truly a pleasure to follow your blog and I refer to all the Madame Chic books often and recommend them to friends. Best wishes for continued success! Dear Debra, I just loved reading about your stylish father. Thank you for sharing your fond memories of him with us. I truly enjoyed this week of reader Q&A's. Thank you to everyone who submitted questions to me. If you have any questions, be sure to leave them below and I might address your question in a future video. I would also love to hear about your morning and night routine and how they have changed as the season has changed. He works a job that requires him to get dirty and wants to know how that fits in the ten-item wardrobe world. I hope you'll check out my video this week because this topic applies to not only people with messy jobs, but also to people who work in the corporate world, or anyone who has to wear something "different" to work. If you are unable to see the video above, click here, look in the sidebar of this blog, or visit my channel at www.youtube.com/TheDailyConnoisseur . Don't forget to give the video a thumbs up and subscribe to my channel. I appreciate your support! Simply Emily is in love with the ten-item wardrobe concept and writes about Lessons from Madame Chic on her blog. Totally agree - the clothes feel like brand new when I pull out last season's wardrobe and I can't wait to wear them again :) I've follow your system since 2012 and this year I started to do the same with my 2 toddlers' wardrobes. Hi Godaifi, it's nice that we can still get the "rush" from buying new clothes, when we simply pull out our wardrobe from last year. I'm glad the ten-item wardrobe has worked so well for you! So glad you're back! I discovered your channel a few weeks ago and you've been my best friend this summer. Honestly! I'm between jobs at the moment and me and my husband just moved to our first family home. So I'm spending a lot of time at home, on my own, sorting out our new home. I watch your videos over and over again, I just let them running in the background to keep me company. It's been such an inspiration. You've motivated me to get dressed everyday even if I don't have to. I say hello to all my neighbors. I take more pleasure (and pride) on everyday tasks. Life feels... better. I guess I just want to say thank you for your work :) Enjoy the rest of your break and congratulations on your baby boy! Thank you so much, Luisa! I'm so happy that my YouTube channel has been a source of inspiration for you this summer. Today, I'd love to hear about your ten-item wardrobe experience. Do you work at a job that requires a unique dress code? Let us know about your ten-item wardrobe experience below and you could be chosen as comment of the week on the blog! See you on Friday, when I answer a question about routines. See you then! This is a special week on The Daily Connoisseur. There will be three blogposts and videos answering your questions, starting with today's question, which comes from Caroline, who asks about how to be chic in college. What a perfect time to address this question as everyone heads back to school. I have a lot to say about college life. It's not exactly conducive to living elegantly! In addition to my advice on avoiding the pajamas-in-class trap, I give important advice on how not to succumb to peer pressure in college. I hope you check out my video and share this with anyone you care about who is entering college. If you are unable to see the video above, click here, look in the sidebar of this blog, or visit my channel at www.youtube.com/TheDailyConnoisseur. Be sure to "like" this video and subscribe to my YouTube channel (it's free!). I appreciate your support! Shamikia from Beauty Fold writes about her favorite parts of At Home With Madame Chic in her article called, Fashion and home life the French way. Hi Jennifer, I just finished "Polish your Poise" this month. I have to say that some of your advice has really helped me lately. Recently I got into a political discussion with a family member I don't always agree with. I've really been taking your advice to heart, especially about not letting others affect your inner peace. Instead of getting defensive about my position, I maintained my cool and listened. Then when there was an opportunity for me to respond, I thoughtfully suggested my stance as an alternative way to look at the issue. The person still didn't agree with me, but I realized that was ok. Just because they didn't agree with me didn't mean my opinion was wrong. We both listened to each other, and the conversation and the rest of the evening was very pleasant. This weekend my friend and I went shopping for some fall updates. When he found a shirt he liked, he went back to buy it in every color. I stopped him. After a little discussion, it was clear that the color he had instinctively grabbed to try on was the only one he actually liked. His strategy is usually to buy a lot of one thing he knows works for him (a useful strategy for someone who doesn't particularly like shopping). I suggested instead "What if you just wear this one a lot? This one will be your favorite anyway, you'll probably chose it over the others whenever you can, so just don't buy the others to begin with." He saw my reasoning. We'll see, but you might have another 10-item wardrobe convert soon! Hi Lillian, I am so happy to hear that Polish Your Poise with Madame Chic helped you to keep your cool with your family member. During this heated political season we are inevitably going to come across people with strong and differing opinions to us. Keeping your poise will not only deliver your point more effectively, it will also help to keep the situation pleasant. I was also glad to hear of your friends' a-ha moment with the ten-item wardrobe concept. Well done! Jennifer, just wanted you to know that you have really inspired me to focus on owning quality items and fewer of them. I am almost finished with my fall/winter capsule wardrobe (I live in Idaho, so it's a little more urgent for me. LOL!) for this year and I could not be happier with it. I feel I have upgraded my look and everything just goes together so nicely. I even took some time and found a pre-owned, but excellent condition, Coach bag for my wardrobe. Its not just clothes, either. For Mothers Day last spring I asked my family for a new, super awesome, gourmet pizza stone. My husband and adult kids all happily pitched in so it didn't strain anyone and I got something useful I really wanted. Tomorrow I am going to the doctor and running a few errands and will wear one of my new skirts, even though I know everyone will wonder what I am dressed up for. It feels so good not to just shlep around in jeans every day. Buy quality! Use our best! Keep spreading the word! Hi Sissy, when you start to truly implement the look presentable always/ ten-item wardrobe/ high-quality clothing concepts from Lessons from Madame Chic, exciting changes happen in your life. I was so pleased to read about your experience. It truly is the small things! Thank you, Tawny! And welcome to The Daily Connoisseur! This week, I would love to know... what was your college experience like? What did you observe? Do you have any advice to give or stories to tell regarding peer pressure? Let us know in the comment section, and your comment could be chosen as comment of the week! See you on Wednesday, when I answer a ten-item wardrobe question from Caleb. Today I have a closet tour for you. Come with me as I show you our walk-in closet and how I store my clothes. This is what a ten-item wardrobe looks like! Many will be relieved to see that there aren't just ten items in there. The extras are mixed in as well. 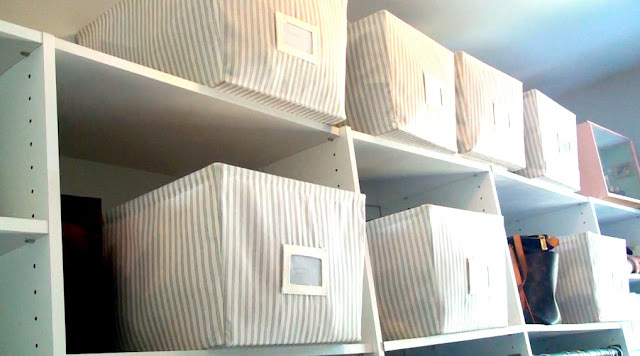 You can see how I store my out-of-season clothes and extras (swim, scarves, etc.) and hopefully you can get inspired to organize your closet the Madame Chic way. If you don't have a chest of drawers, use canvas bins to store your clothes. I get mine from Bed, Bath & Beyond. Place a cloth at the top of each out-of-season bin so your clothes don't attract dust. Be sure to regularly go through your bins to make sure you aren't holding on to clothing or accessories that you never use or wear. Make all of your hangers uniform. Get rid of wire hangers and invest in hangers that will treat your clothes well. This will also improve the visual appeal of your closet. Use scented sachets for everything from your tee shirts to your undergarments. In this video, I show you ones that were gifted to me by a family friend from her company, The Linen Souk. If possible, only hang up the clothes that are relevant to the season you are in. This will bring clarity on busy mornings when you are trying to figure out what to wear. Regularly go through your closet to organize and assess. 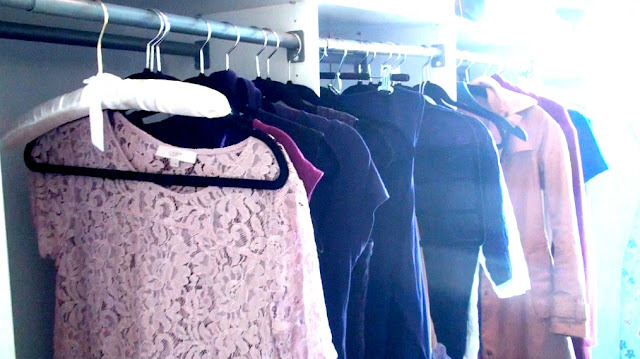 Enjoy your closet space and make it look like a chic boutique. Thank you to ballerina, Kathryn Morgan, for featuring my YouTube channel and books in her August Favorites video. If you don't know Kathryn, you will love her videos! She is a wonderful example of a poised lady. Thank you, Kathryn! Also, Travelettes includes Lessons from Madame Chic in her article, 4 Books You Must Read Before Visiting Paris. This might be one of my favorite videos ever, Jennifer! Thank you so much for taking the time to do this! It is so refreshing to have someone be so upfront and honest with the struggles of dressing ourselves through the different stages of our lives, especially during pregnancy and nursing, when most women still have some weight to lose. I have had seven children myself and for some reason, I felt like I could only have a 10 item wardrobe when I was at my pre pregnancy weight. I was honestly so confused on how to implement it during the first few months of pregnancy, when regular clothes don't fit, and the first 4-6 months postpartum when very few of my clothes fit and feel like they should! I would usually end up buying several really cheap items to get me through, but the quality was poor and they made me feel worse and affected my self esteem. I hated feeling like that at such a joyful period in my and my family's lives! Now I know that especially for these times when are bodies are not as they usually are, to keep quality rather than quantity in mind, and it's ok to gave a 5 item wardrobe of beautiful and flattering clothes and to just keep an eye out for what you need and to not feel the pressure of having certain things right away(for instance a pair of jeans.) This week's video was so very helpful and I think I can speak for a lot of us when I say your candor and your beautiful but down to earth way of handling life is so refreshing. You look beautiful and congrats on your precious baby. Thank you for your kind words! It's true, our bodies go through so many different phases that we need to stay centered and commit to dressing well, no matter what phase we are in. If that means paring down the wardrobe to a very small size, so be it! I love the feeling of peace I get from my small wardrobe. I love to share the ten-item wardrobe and see how it positively affects other people's lives. I thought you might be interested in my recent experience with a limited wardrobe. I have just started a new job after many years of working from home and raising my children. My immediate instinct was to go shopping for new clothes – although my work environment is not very formal, I do need to look presentable. Financially, a shopping trip (or, more likely, a catalogue-shopping binge) was out of the question. So, with you in mind, I did a thorough review of what I already had and found three serviceable dresses, two summer dresses that I’ve had for several years and another dress that I bought for a special occasion and have not worn since. With two cashmere cardigans, one of which I repaired, I have enough to be presentable five days a week. I have some tailored trousers for when the weather cools and I am on the lookout for a neutral skirt to mix and match. New is not necessarily better. I have always thought that confidence came from new clothes. In fact, the same feeling can come from having my outfits well planned. The two summer dresses were not favourites. In fact, one of them I did not like very much but being ‘forced’ to wear it has made me value and like it more. There is a satisfaction that comes from ‘wearing up’ clothes, rather than adding new ones. It is like the feeling that comes from using up the last bits and pieces of food in the fridge at the end of the week. Finally, when I do purchase new clothes for my work wardrobe in the future, I will have a clearer idea of what works best and what I really need. Dear Jo K, thank you for sharing your experience with us. What I like most about your process, is that it was thoughtful, disciplined and not rushed. I am so happy you are taking satisfaction out of the ten-item wardrobe concept. I picked up "At Home with..." from the library. Thank you so much for writing this book. It is beautifully written and exactly what I needed. Sharon, thank you so much for your email. I am so happy that At Home With Madame Chic has brought you joy! This week I would love to know what you thought of my closet tour. How do you organize your closet? How is your ten-item wardrobe coming along? Let me know and your comment could be chosen as a comment of the week on the blog. Happy Labor Day! In this week's video, I am sharing my process of transitioning the ten-item wardrobe between seasons. I show you how I store my out of season clothes (in canvas bins from Bed, Bath & Beyond) and discuss my unique situation this year with the ten-item wardrobe. I hope you join me and that this video inspires you to organize your closet the ten-item wardrobe way. Be sure to tune in for next week's video where I give you a tour of my closet! For my Japanese readers: I have a newly released DVD book in Japan that includes 18 original videos, all in Japanese, that I made just for you! This wonderful DVD is brought to you by the Young Corp. I hope you enjoy it! Also, Deanne, from Smart Solutions for Busy People tries out the ten-item wardrobe. Have fun, Deanne! I enjoyed your video about getting ready for the Coldplay concert. I loved your nail polish and am wondering if you would share the brand and color. Thank you, Frances! The nail polish I wore in last week's Get Ready with Me video was Essie Mademoiselle. Looks like you had a blast! I saw Coldplay in college when they were just getting big in the states, at a small theatre in Indianapolis. It was right when Chris Martin and Gwyneth Paltrow started dating and he got her to very shyly poke her head out and say hi. It was a blast and I love the way he rocks out on the piano. No one does it quite like Chris does! I too cannot pick a favorite song of theirs because so many of their songs have good memories for me. Hi Summer, that must have been so fun to see Coldplay in a small venue! Some of my favorite songs of theirs are Yellow, Lovers in Japan/ Reign of Love and A Sky Full of Stars. I love their whimsical lyrics. This week I would love to know... are you prepping for your fall ten-item wardrobe? Are you having any trouble? (If so, leave me your concerns and I can address them in a question of the week segment.) Are you having any success? Let me know everything. See you next week for a closet tour!